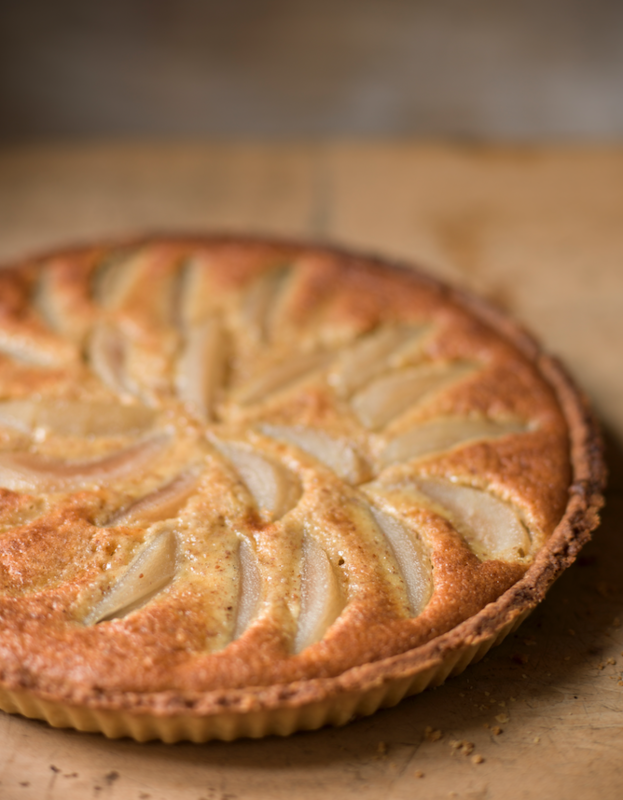 Tarte aux poires Bourdaloue is made with crisp sweet pastry, poached pears and almond cream. Peel the pears, cut them in half and remove the cores. Pour about 300ml of water into a large pan and add the vanilla pod, cinnamon stick and sugar. Bring to the boil, then add the pears and simmer them for 20 minutes. Leave to cool. You can do all this the day before making the tart if you like. To make the pastry, cut the butter into small pieces and leave it to soften at room temperature. Sift the flour and salt, place them on the work surface and make a well in the centre. Add the butter and sugar and gently work together with your fingertips. Add the egg yolk and gradually draw in the flour, adding drops of water as you go. When all the flour has been incorporated, shape the dough into a ball, but do not overwork it. Wrap the pastry in cling film and refrigerate for at least 2 hours before using. For the almond cream, whisk the butter and sugar until pale, then add the ground almonds. Whisk in the eggs, one at a time, and finally the rum. Preheat the oven to 200°C/Fan 180°C/Gas 6. Roll out the pastry on a floured surface to a thickness of about 3mm and use it to line a greased 28cm flan tin. Prick the pastry base with a fork, line it with greaseproof paper and fill with baking beans, then bake blind for 20 minutes. Remove the paper and beans and put the pastry back into the oven for another 5 minutes or until the base has cooked but not taken on too much colour. Leave the oven on. Spoon the almond cream into the tart base, then arrange the sliced, drained pears on top, with the pointed ends towards the centre. Bake in the preheated oven for 40 minutes. When the tart is cooked, warm some apricot jam with a little water and brush it over the surface. Sprinkle the tart with toasted sliced almonds and serve warm.